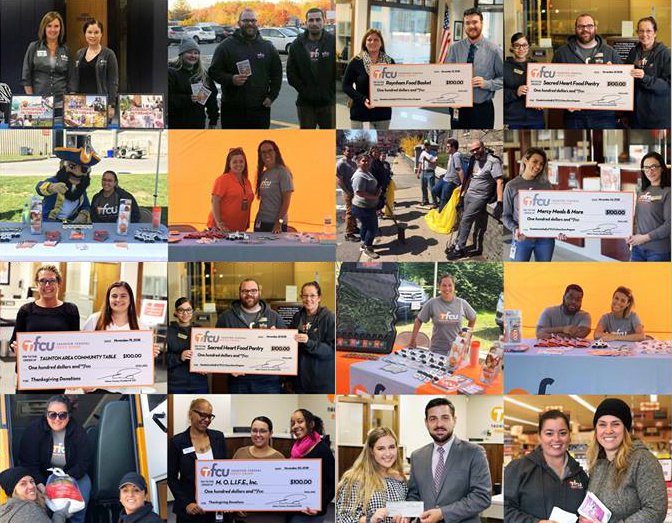 TAUNTON, MA (January 7, 2019) — Each Friday, Taunton Federal Credit Union employees donate money in order to participate in TFCU’s Dress Down Program. Funds donated are then used by our Public Relations Committee to make donations throughout the communities we serve, which include Bristol County, MA and most of Rhode Island. This year, TFCU’s Public Relations Committee was able to donate over $6,000 to local organizations and charities! These organizations include: Scoutreach, Friends of the Taunton Animal Shelter, Girls Inc., The Jimmy Fund, Rise Up For Homes in New Bedford, Co-Operative Production, Boys & Girls Clubs of Taunton & New Bedford, Taunton High School, The Matthew Mission, Taunton Area Community Table, the Rhode Island Community Food Bank and many more! TFCU’s Public Relations Committee meets monthly to review donation requests from local organizations and the community. For additional information or to submit a donation request, please contact Jason Gregory at 14 Church Green, Taunton, MA 02780, or call (508) 824-6466.